Should there be a new North Downs National Park and are the Malvern Hills Britain's original prototype National Park? - scroll down to our British National Parks INDEX and consider the arguments. The modern perception of a National Park resulted from pre-war measures to protect the countryside and to provide access for the urban population of Britain's industrial towns and cities. The Second World War delayed the implementation of such designation although detailed proposals were well advanced. After the war there was great deprivation as we recovered from the conflict and the new National Parks were seen as something that was worth fighting for with the associated sacrifice of life. The year 1951 saw a number of designations confirmed and the National Park movement was at last underway. Or was it that simple? No, the Victorians had got there a lot earlier in the 19th century. Although not named a National Park, the Malvern Hills could arguably be called Britain's original National Park, being established with its own statutory administrative body and countryside protection initially under an Act of Parliament of 1884 with subsequent amendments. With its priorities on public access and conservation, the Malvern Hills were well established as a specially protected area by the dawn of the 20th century. The Malvern Hills Conservators (now called the Malvern Hills Trust) were empowered by an Act of Parliament that enabled them to resist everything from intrusion by major new road schemes, water company projects and urbanisation. In addition access by the public was and remains top of their agenda. A similar argument to that above applies to the North Downs where Banstead Commons are managed by a body of Conservators. This status is being used in the proposal for a new North Downs National Park. CLICK THE LOGOS BELOW TO GO INTO THE WEB SITE OF THE ADMINISTERING BODY. Proposedl Date of Designation: Conservation Board by 2020. Full National Park status confirmation - 2025. Administered by - North Downs National Park Authority. This is a new proposal for a North Downs National Park to the south of London. The preliminary maps featured on this web site (click the windmill logo above) set out an area stretching from Hampshire, through Surrey to Kent, following the line of the North Downs escarpment. The central location is seen as Tadworth in Surrey which is noted for its extensive 'freedom to roam' downland landscape in the immediate vicinity. The site of Tadworth Mill and adjacent buildings is proposed as the ideal position for a National Park Centre with the windmill becoming an iconic landmark and logo for the national park. Administered by - South Downs National Park Authority from 1st April 2011. Click the Sussex University Armorial left to read "Tourism and the Sussex Downs", the major study that was instrumental in orchestrating National Park status for the South Downs. Date of Designation Confirmation - - Although not named a National Park, the Malvern Hills could arguably be called Britain's first National Park having been established with its own statutory administrative body and countryside protection initially under an Act of Parliament of 1884 with subsequent amendments. On an International level the definition of a National Park includes the inalienable status of the land. This is achieved by the park area being owned by the nation for the nation, with appropriate legislation that curtails the inappropriate management of the land. In this respect the Malvern Hills are more a National Park than the 15 designated British National Parks. In the 15 British cases, the land is largely privately owned and the national park legislation curtails the rights of the landowner to develop and manage the land unhindered. 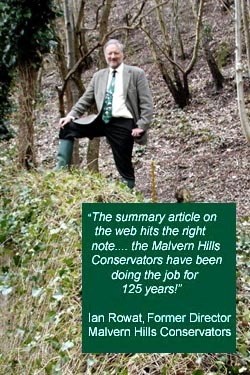 However with the Malvern Hills the land is owned by the Malvern Hills Conservators (now called the Malvern Hills Trust), representing the Nation, with statutory obligations to manage the land within strict parameters. By owning the land area, the Malvern Hills is nearer to the International model than the so named British National Parks. In the event of formal acknowledgement that the Malvern Hills are Britain's original National Park and that formal designation should be pursued, a further possibility would be the inclusion of the Teme Valley to the north, from the confluence with the River Severn to Tenbury Wells in the west. Much of this area is designated great landscape value (AGLV). It is noted not only for its archetypal English countryside appearance but also its distinct geology. Click the University of Sussex Armorial left to read the Malvern Hills case study in the Sussex Downs Tourism study. Click the University of Sussex Armorial left to read the Dartmoor case study in the Sussex Downs Tourism study. Further Reading - Smith R (2015) National Parks of Britain, AA Publishing.